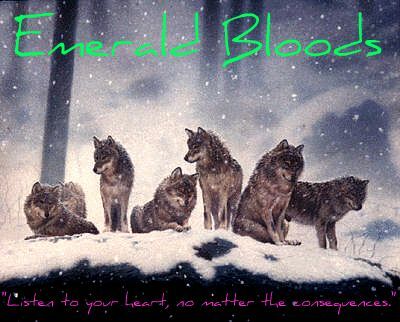 The Emerald Bloods is a pack of semi-peaceful wolves. This is the official forum website. This is where the rules are for roleplay. Please check back often. This is where I will post the latest news, like when a member is on EFA or when I announce the Pack Member of the Month. Please check back often. This is one of the roleplay places for the pack. Newcomers can only start roleplaying in The Borders before making their way here. This is where all newcomers are to start roleplaying after they have made their wolf biography in Wolf Bios. This is the borders of the pack's territory and you are to start as a loner looking for a pack. This is where all pack members that have been accepted on WolfQuest are to post their biography of their wolf before roleplaying. This is where the Healers and their apprentices travel to. An apprentice ready to become a Healer is either accompanied by a Warrior or its Healer mentor to be accepted as a full Healer of our pack by our ancestors. A yearling who wishes to become a Healer must travel here with a Healer to be accepted as a Healer apprentice by our ancestors. This is where members can play forum games. Or if you don't see any you like then create your own! This is where you can write stories about your wolf or about the pack. If it is about the pack then please make it Fantasy (which means the story was never real but just made for our entertainment). If it is about your wolf then please state whether this actually happened to your wolf or not. Please keep violence to a medium and no cussing. This is where you can post art. It can be of a hunt, a screenshot from WolfQuest, an anime wolf you drew, or something like that. Please no inappropriate pictures. This is where I would like members to post their ideas on how we can make this website better. Here we can chat about things that have nothing to do with the roleplay. Remember, no cussing. This is where we can post what other packs we're in. Please provide the WolfQuest topic URL, your wolf name, gender, and rank there, and (optional) can create a topoc here to advertise a pack.